Another week come and gone! It hasn't been a week of anything spectacular but when nothing bad happens it's considered a win, right? That last workout was definitely the best, because I had an awesome companion - hubby! We each tackled 10 minutes of cardio separately - Tim on the treadmill and me on the bike - and then did the strength training together. Push-ups, ab work, planks and tricep dips. Awesome workout! I had to bribe him with burgers and fries from Five Guys afterwards, and a trip to see the new Mission Impossible. It was good, but like 2 hours longer than it needed to be. We get it already. There's a crazy mission, a bomb, some guns and an international misunderstanding. It's been done. 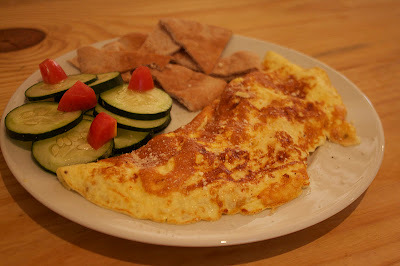 Fun eats the last couple of days start with my "invention" of ricotta cheese in eggs. Note that the word invention is in quotation marks. That's because I thought I was a genius for thinking of the combination, only to realize when I Googled it that about 6 million people had already been there, done that. I made an omelet with two whole eggs, one egg white, tomatoes and a big scoop of ricotta cheese and it fluffed up to be HUGE. Paired with some pita bread and cucumber salad. That's Abbi of Higher Miles! Congrats Abbi! Send me an email with your mailing address so I can get those books to you! Anyone have any plans for the holiday tomorrow? Sadly not for me, I'm working tomorrow. I actually kind of forgot it was a holiday until this weekend! Anyone watching the Golden Globes tonight? What's better - the award ceremony itself or the fashion recaps the next day? Right now it's on in the background, but I get kind of bored watching it to be honest. BUT - I'll be all over the worst dressed in a minute. That I can totally get behind! Those eggs sound yummy. I'm gonna try that. Congrats on the win abbi! No plans here and not watching the Golden Globes. I might try and hit up the gym but I think its closed being its a holiday tomorrow (gym on base). Not sure. If it is, I will just do some yoga (30 mins). Its snowing and will continue to snow like this until Tuesday so no running outside for me! The chicken tenders look delish! Great workout week too!! No holiday for me tomorrow - working (boo!). I MUCH prefer the Fashion recaps the next day. On the E channel there is a show called Fashion Police - it's prety harsh! Yum! I have to admit...the roasted sweet potatoes sound the best! Love that you had a workout buddy today :) nothing exciting for the holiday exept that I am flying out for my first interview. Eeek! I work tomorrow. Great workout, it's fun to have a partner. Not likely watching the Golden Globes. All these award shows! I loved roasted veggies of all kinds... and especially those orange sweet potatoes that we incorrectly cally yams here. I love them with ketchup too! The Captain makes them in wedges for me and the edges get crispy like oven-fries. I love your healthy meals! 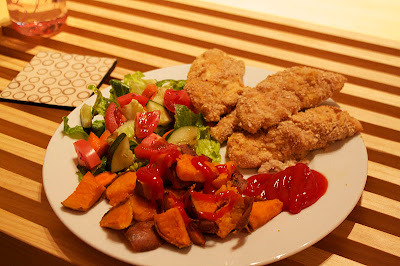 Yum...the chicken strip meal looks so yummy and I would love to make baked sweet potatoes! Your omelette sounds delish. No plans for tomorrow cuz I gotta work! Golden Globes are on right now, but it's going to be turned soon- Dallas hates Hollywood. Can't say I really blame him. Great week! I'm thinking I'm going to cut back to 3 days/week running. With my history of injuries I'm trying to figure something out for this next marathon training cycle. what guy doesn't love FIVE GUYS? good stuff. although the kids meals (chicken tenders) is a close second. My husband likes it with peas and macaroni. Yep, he's 5 yrs. old. Yum! I'm defintely having eggs for breakfast in the morning! We don't have today off, so my plans are "go to work." Bummer. nothing big on the agenda today. perhaps a run this morning! Since I am a counselor in a residential home, the kiddos are still there, I have to work today (Monday). But I will do a run first! I didn't have to teach at 8am this morning, so I actually slept in until 8. I've had a cold all weekend so my plans for the day include taking it easy and doing a bit of work on class prep for the rest of the week. Maybe you didn't invent the ricotta idea, but you brought it into my life, and now I can't wait to try it. I'm somehow sick again so my plans today are "lay around and try not to cough until I puke". Good times! Great workouts! Are you feeling better? It looks like you are! And I love ricotta in eggs, mmmm! mmm those tenders and that Omlete look fantastic!! Newness for me: I started Yoga this week. Today was my first day! Monday I was still out of town from a winter, snow 13.1 on a snow covered gravel trail. Enjoyed the scenery out there--but it was never a race in my mind due to the snow. Congrats Abbi! Great week Vanessa!